Beautiful Bikes...the bikes people ride and why? Episode 2. Stephen Goodall’s Hillbrick, Carindale, Brisbane. About the rider: Tell us a little about yourself? I’m a middle aged (over 50!) Brisbane born bloke with a lovely wife and great son. I’ve been working in science throughout my career and like to travel and stay fit. I’ve lived in Brisbane most of my life but enjoyed about three years in Newcastle and worked with US and French companies giving me plenty of opportunity to work around the world. I’ve probably passed my fitness peak now but still enjoy getting out for a ride with friends and turning the pedals around. What sort of riding do you do? These days it’s mainly commuting with a bit of training and cruising with friends. At various times in the past I’ve done some criterium and road races and enjoyed being a member of the Balmoral Cycling Club. About 30 years ago I bought my first proper road bike for commuting. I've been riding pretty consistently since then but really got serious when I decided to get my Hillbrick about 15 years ago. How did you come to choose your bike? I’m pretty keen on buying Australian made where I can and getting a custom frame from Paul Hillbrick wasn’t much different in price from buying a good bike off the rack. There’s also a bit of fun in getting all your measurements together and working out the geometry. Paul also spent the time to ask what kind of riding I wanted to do and how I wanted the bike to handle. The guys at UQ bike shop then went to work to get all the components and build from there. They were great at helping the selection process, so the final product was just brilliant. Groupset: What’s you choice of weapon? 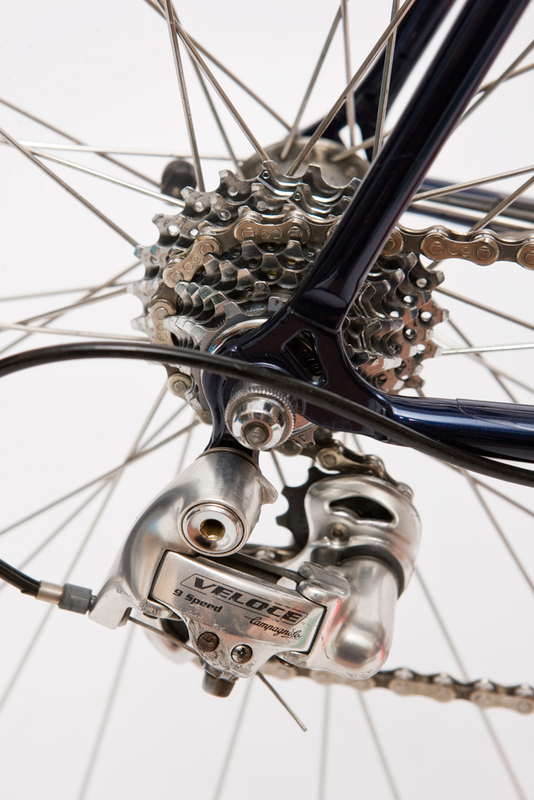 I’m still riding on the Campagnolo Veloce groupset that the bike was originally assembled with. I’ve been through countless chains and cassettes but only one small chainring and a couple of sets of brakes. Pretty good for over 45,000kms! Do you have any particular favourite component, accessory or add-on? It would have to be my helmet. It irrefutably prevented my demise in an accident several years ago. So I’m constantly astounded by people who advocate repealing the helmet laws. I’ve talked to the guys at Baum in Geelong, that’s my preferred way of getting another custom built Aussie made bike. Finally, and most importantly does your steed have a nickname? My Hillbrick has just had a new paint job to refresh the original colours. It’s just like new and still rides better than my other bikes that I rode while the paint job was underway. What a gem! If you would like us to feature your ride in the 'Beautiful Bikes' Series send us a pic to peter@peakcyclewear.com and we'll get back to you. Promise.